Indonesia - With something as evident as fire, it would be easy to assume that what you see is what you get. But according to a new study, perceptions of peatland fires in Indonesia vary considerably among different actors, offering an explanation of behavior, action and environmental outcomes on the ground. A study led by Rachel Carmenta, then at the Center for International Forestry Research (CIFOR), in collaboration with the Universities of Lancaster, Cambridge and Florida, used a novel approach to map out the perceptions of different stakeholders, from international policymakers to local farmers and absentee landlords, all of whom have a role to play in the use, management and future of peatlands. Using Q methodology — more commonly used in psychology to identify stakeholder subjectivity on a particular issue of interest — the research team was able to gain insights into how various groups perceive the benefits and the burdens of peat fires and the resulting toxic smoke, or ‘haze’, as well as how they perceive the effectiveness of potential solutions. “We were keen to understand more about how the peat fire situation is perceived by the diverse groups of stakeholders involved, because perceptions can tell us something about why we observe what we do in their current management, and indicate pathways to a more sustainable future,” Carmenta says. An initial result of the work was that rather than the often simplistic framing of two main actors groups — smallholders and agro-industrial players — driving the fires, in fact, a suite of actors are involved, and their motivations for fire use extend beyond cheap land clearing. 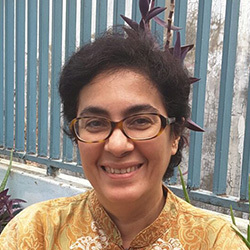 “We focused our efforts on Riau because it is a contemporary peatland frontier, with lots of new actors, from international business interests, to town-based investors, to small-scale farmers migrating from other parts of Sumatra, radically transforming the landscape in a process that directly or indirectly involves fire,” Carmenta explains. Twelve distinct stakeholder groups were identified via field-scoping in Dumai, Riau, over six weeks in early 2015, along with expert consultation and a literature review. Many of the stakeholder groups were found to maintain particular perceptions about peatland fires. “The extent of peatland transformation is rapid, and radical land-use change has taken place in Riau over a relatively short period of time,” Carmenta says. “Understanding better the full costs of the fires, across sectors such as health, education and environment would enable an improved understanding of the real returns from crops such as oil palm and acacia and could inform future planning and management,” she adds. Fire is pervasive in Riau both from intentional use and conditions that enable fire to spread accidentally. For example, reasons for intentional burning can include land preparation, or disputes over land and resources. Indirect drivers of fire include peatland drainage, necessary for many of the plantation crops grown on peat, which results in increasingly flammable conditions. “Accidental fire (that is, fires spreading beyond intended limits) is influenced by the drained condition of the peat, which itself is a fuel for fire spread, and contested tenure, which means incentives for fire management are not ideal,” Carmenta says. The research shows significant distinctions among groups of perceptions, clear areas of agreement and controversy, and discusses the implications for future fire management intervention (FMI) design and the governance challenges of global environmental change. The researchers were able to identify which of the many possible benefits and burdens ranked the highest in importance among the different groups. The results show that the public health and biodiversity impacts of fires are areas of concern that unite otherwise diverse groups. “The high priority given to the health impacts was expected, because the situation was so severe in 2015. However, we were surprised that both greenhouse gas and biodiversity burdens also rated overall as key concerns held by a diverse group of stakeholders,” Carmenta says. When it came to identifying what these different groups thought about solutions to the peat fires, the research group analyzed the responses of participants to a set of contemporary FMIs, including leading policies designed in response to the 2015 fires. Results showed that the FMIs ranked overall as the most effective , but were also those that generated the greatest controversy between groups. “We show that most of the solution options perceived as most effective are also those which generate the most disagreement among stakeholders,” Carmenta says. These interventions include increasing use of shallow canals to ensure access to water, provide fire breaks, and maintain higher water tables; forbidding new agricultural expansion on peatland; and increasing enforcement measures against companies that have fire within their land. “These are some of the very interventions that are front and center today. This result attests to the challenges ahead for policymakers and implementers, and raises questions over how to reconcile such competing interests and what policy instruments will do this most effectively,” Carmenta says. The study suggests that a mix of targeted policy measures and dialogue between diverse groups will be essential in designing and implementing a sound, high-performing, FMI approach to overcome the existing policy-practice gap. This is one of the leading challenges to peatland fire management and, arguably, to the governance of many other manifestations of global environmental change. For more information on this topic, please contact Rachel Carmenta at rachelcarmenta@gmail.com.